People hold portraits of NSU victims in front of the Higher Regional Court in Munich, Bavaria, Germany, July 10 . A Munich court announced the much-anticipated verdict in the five-year National Socialist Underground (NSU) trial yesterday. Beate Zschaepe, the sole surviving member of the neo-Nazi gang behind the murders of eight Turks, was sentenced to life for her role. Four others were handed down prison sentences between three and 10 years for aiding and abetting the gang. The verdict was far from satisfying for Turkey and the families of the victims who have called for the prosecution of the "real culprits," claiming that the gang was certainly aided or at least ignored by German authorities, particularly the intelligence agency whose informants were aware of the NSU's activities. 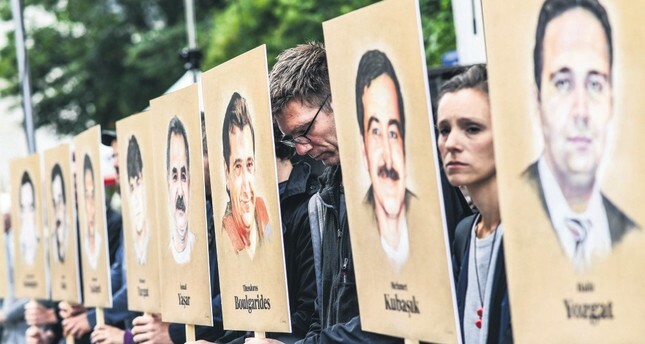 Foreign Minister Mevlüt Çavuşoğlu, who was in Brussels for a meeting yesterday, told reporters that although it was important that Zschaepe and the gang's accomplices were sentenced, the process failed to reveal the "others behind the murders." "Defendants openly admitted that they had the support of [German] intelligence and deep state, but who or which agencies were behind them was not investigated. It is safe to say that the court failed to shed light on the real culprits," he said. "Who are the people behind these murders? Which agencies are involved? These people should be sentenced as well." "There have been racist attacks in Germany and Europe and rising racism. You cannot prevent it without punishing all those responsible," the minister stated, vowing that Turkey would closely monitor the ensuing legal process. "We expect Germany to continue investigating to find the other culprits," he added. The NSU is implicated in the killing of 10 people, including eight Turks and a Greek man, mainly for racist motives. The gang composed of Zschaepe, Uwe Mundlos and Uwe Boehnhardt also killed a German policewoman. The gang is also charged with a bomb attack on a Turkish neighborhood in Germany. Mundlos and Bohnhardt took their lives when the police closed in on them. The trial started five years ago, but it failed to respond to allegations of a cover-up of intelligence services' ties to the gang and the neo-Nazi scene in general. Zschaepe had set a house she shared with Mundlos and Bohnhardt on fire in an attempt to destroy evidence related to the crimes of the NSU in 2011 before turning herself to the police. Critics of the case claim police and intelligence services hired people from the neo-Nazi scene as informants trying to erase their tracks leading to the NSU case. Despite its links to many gangs in Germany's neo-Nazi scene, the NSU apparently went unnoticed for years, from the late 1990s to 2011. Authorities initially blamed domestic disputes in the Turkish community for the murders and other crimes between 2000 and 2007. The final hearing was opened in the Munich High Court early yesterday. A large crowd gathered outside, some even camped out near the building the previous night. Few were allowed inside the courtroom. Zschaepe, dressed in black, silently listened as Judge Manfred Goetzl announced the verdict. Her lawyer said they would appeal the verdict. Zschaepe, 43, went underground in 1998 with Mundlos and Boehnhardt, 12 years before the two men were found dead in an apparent murder-suicide. She has denied her role in the killings as well as the robberies and bombings carried out by the gang, although she admitted she was aware of the crimes. She apologized to the families of the victims in a previous hearing. Although there was no evidence she was present at the scenes of the crimes, prosecutors said her 14 years with the gang made her culpable of the NSU's crimes. Ralf Wohlleben was sentenced to 10 years, while Andre Eminger was sentenced to two and a half years in prison. Holger G. and Carsten S., two other defendants, were each sentenced to three years. Wohlleben was accused of supplying the gang with a handgun and silencer they used for the killings. He was a former member of a far-right party. Carsten S. was accused of physically handing the gun, a Ceska, to Mundlos and Boehnhardt. Eminger arranged rental and mobile homes for the NSU during the trio's run around the country. Holger G. was convicted of providing a firearm to the gang and forging IDs for them while the trio was on the run. The court ordered to release Eminger since he already served his time in pre-trial detention. Among the court audience of around 50 people, some neo-Nazis were also present. They were clearly happy with the lenient sentences handed down to the defendants and applauded the court. The Turkish delegation left the session after neo-Nazis were not even handed a warning by the chair of the session. After the end of the trial, neo-Nazi militants gathered in front of the courthouse also celebrated the decision. They were, however, confronted by a group of anti-Nazi, anti-fascist protesters, who shouted: "the state was in it." They added that it was a slap in the face by the German judiciary "but we will not give up." Police had to intervene as the two groups locked in a clash. The unsatisfying conclusion of the trial also drew reactions from German lawmakers. Anton Hofreiter, head of the Greens' parliamentary group, said Chancellor Angela Merkel did not fulfill her 2012 pledge to shed light on all the details in the case and criticized the German intelligence agency that "thwarted efforts to shed light on the case." Hofreiter said the verdict should not be an end to the case.